I was thrilled to see these pictures posted on J-Crafts (Yahoo group) Her crafts are exactly what I was hoping to post for inspiration for my Fun Pages. A teacher willing to make heirlook quality crafts in a class for childreen/teens for camp, scout or school setting. After years of teaching crafts myself and as a parent, I have long been tored of children taking home crafts made of paper I have no where left to hang or air dried clay etc that quickly falls apart. "All the projects require a lot of prep and/or special tools or materials. They are what you might call 'heirloom quality' projects and are not be undertaken lightly( time and Money wise)." The information provided here are not full instructions but I thought you might enjoy them. Yads are an attempt to have a high-success project for older kids, 11- 13. Glass beads are purchased, with a custom molded resin 'hand'. (Her rabbi said he thought a resin hand-part would be fine). She drilled a hole into the hand and inserted a length of piano wire (music wire). Her daughter picked the beads and she used epoxy to attach the hand and the end. The yad uses a custom cast 'hand' she made using polyurethane resin and a custom mold (that she made using silicone rubber). She wanted the hands to be of good quality so that the project becomes easy and successful. 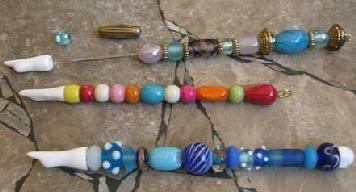 Kids select the beads and string them onto a piece of paino wire (stiff spring steel). Use epoxy or similar glue to attach hand and end bead. Older kids could also embellish with spirals or loops of fine wire with seed beads. Nice glass beads are pricey, but they can be mail-ordered or gotten on sale. Bead cost could be $1-$5 for one yad. She is not sure how to substitute for the resin hand - polymer clay might work, but is not that strong for the index finger. Maybe reinforce the finger with a small piece of wire. Epoxy putty is a stronger option for hand-molded hands. The Jerusalem tzedaka boxes are a tried and true project that she has made with 4th-6th graders. She cast all the bricks using a high strength plaster, tinted to resemble Jerusalem limestone. The windows are closed with recycled plastic. The lids come off to remove the coins. The tzedaka box uses bricks from molds from www.castlemolds.com The molds are pricey and take time and effort to produce enough bricks for a class of kids. (Takes about 45 bricks, plus several arches and decorative pieces to make one building. Not to mention floor tiles for the roof). She ended up making a some custom molds for the roof coinslot. 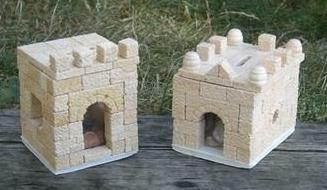 Finally she made molds to cast two standard roofs - 3"x3" square and 3"x4" roof. The oil lamp does work for burning oil... because it is fired in a kiln. 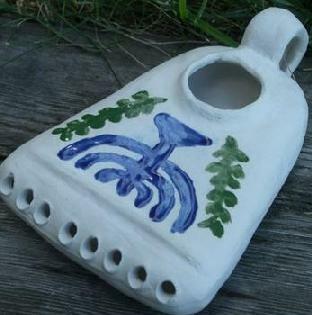 The oil lamp is version 1 of a slip cast mold. She uses plaster to make the slip mold. The plaster takes several days to dry befoe she can cast the slip. She is trying to make a single wick lamp of similar design. The original lamps appear to have been unglazed, but she wants to let the kids use modern glazes. The lamp does burn olive oil, using cotton yarn or wicking.